This 30 minute webcast from infrastructure optimisation specialist Teneo shows how Server, Application & Network optimisation can increase efficiency and reduce costs. It includes content related to Veloxum, Palo Alto Networks and Riverbed. Mike Matos, VP Sales, Teneo Inc. This 45 minute presentation will show you how to make your virtualized infrastructure perform better at lower cost. The webcast will introduce Veloxum and its Active Continuous Optimization (ACO) technology. As we come out of global recession, businesses are now beginning to think about growth strategies and necessary technology investments to enable this. There is still however a huge emphasis on cost containment within the Data Centre. Optimisation technologies allow you to effectively make use of your existing hardware and network, maximising the investment you have made in these first before you consider acquisition of new equipment. 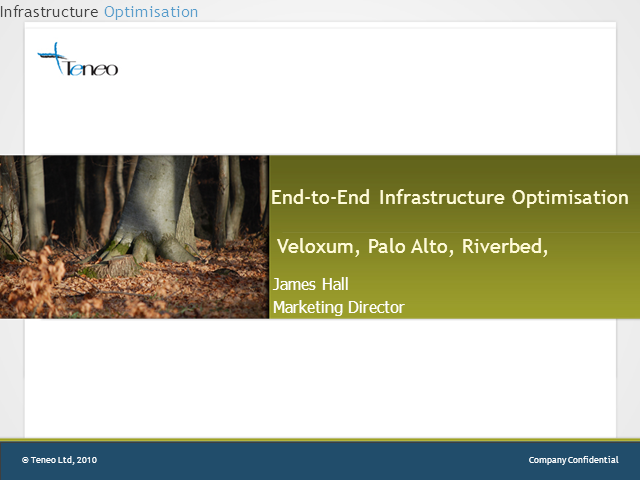 This webinar will look at a couple of optimisation technologies, Veloxum and Riverbed, that can specifically help you to do this. Organisations face a multitude of daunting IT challenges. Mergers & acquisitions require significant network integration & consolidation. Cost-cutting has become a necessity to ensure survival. Security is an ever-present concern. Regulations demand proof of compliance. Availability is paramount as minutes of downtime can be extremely costly when users want 24x7 access to data & applications. The pressure is on to make IT investments that fall within budget, show good ROI & improve efficiencies in the way you work. Teneo, an Infrastructure Optimization company, provides solutions & services that help organisations with the Management, Performance & Security of their Network, Applications & supporting devices. Feedback from our customers states that we offer the best products & support, we take time to listen to our customers & our collaborative approach helps them to achieve their end goals.